Bar Crusher – boats fit for royalty! Navigating the King George River, in remote north Western Australia. King George River... photos just don't do it justice! A well-secured mozzie net is essential for any trip in the tropics! Joy cooking dinner during a stop-over at Berkeley River. Collecting fresh water at the falls. The rope ladder at East Arm Falls. Rain's ok... fish aren't scared of water! 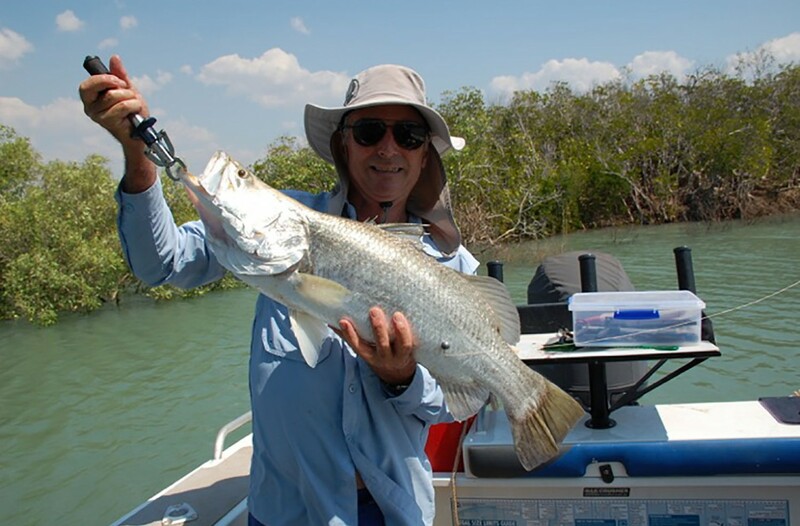 Graeme with a nice barra from Thorburn Bluff. Refilling the flexi drums, with a fuel store left on the beach days earlier. A milk crate secured to the marlin board was a great storage place for rubbish. Wyndham boat ramp: where the on-water adventure started and finished! Home again, home again... 775km (travelled on water) later! Another Bar Crusher adventure done and dusted! Having owned many boats over the years, we took delivery of our Bar Crusher 615C in 2014. We’ve enjoyed a couple of extended adventures in this boat since, with many more planned in the years ahead. 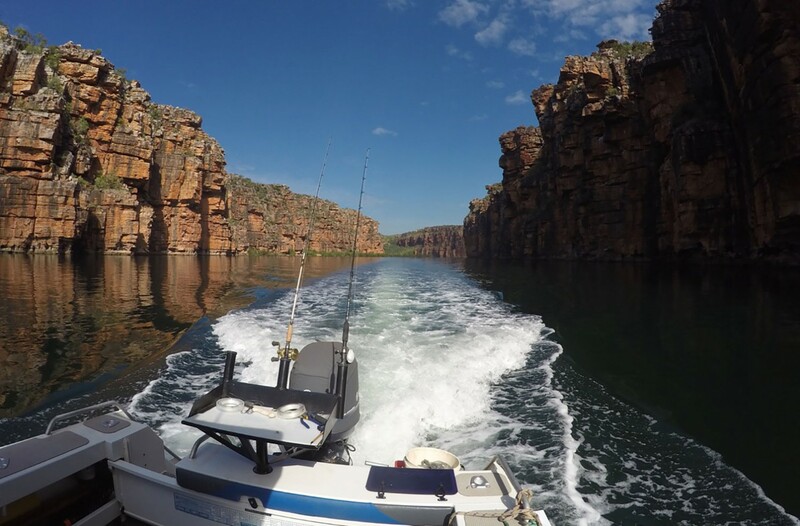 Based in Karratha, Western Australia, we christened Number Three with a 10-day trip up north to the Berkeley River in 2015. It was while negotiating this remote waterway when we discovered our boat was croc proof! At Casuarina Creek, we had filled the Quickflow water ballast system and closed the Bar Flap before anchoring for the evening. The gentle slap of water on the chines throughout the night (while we thought it was soothing) obviously annoyed the resident crocodile. 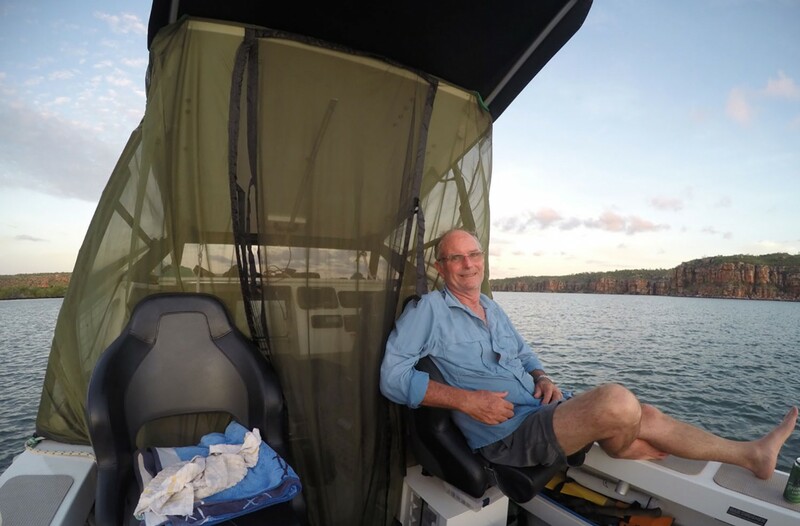 We woke in the early hours of the morning to a screeching sound and shaking of the boat, and quickly got up to see a massive swirl as a big croc disappeared into the deep, dark water. Daylight revealed the croc had attempted to wrap its jaws around the boat, right where the chines met the water on the starboard side of the boat. 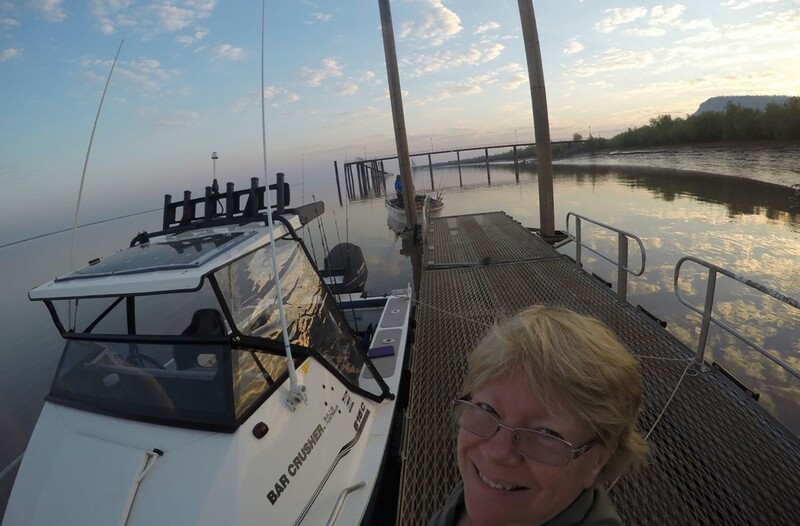 Following this experience, we agreed another remote fishing adventure seemed very do-able! 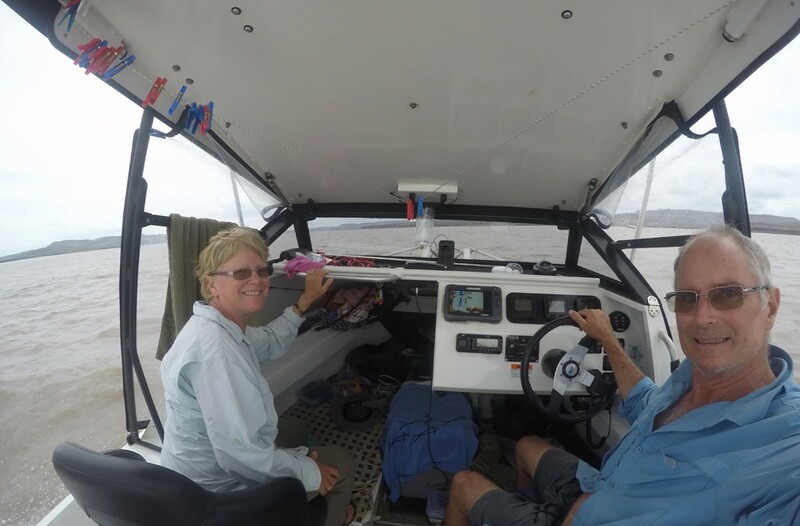 After many months of planning, we embarked on our journey to the King George River in April 2016. 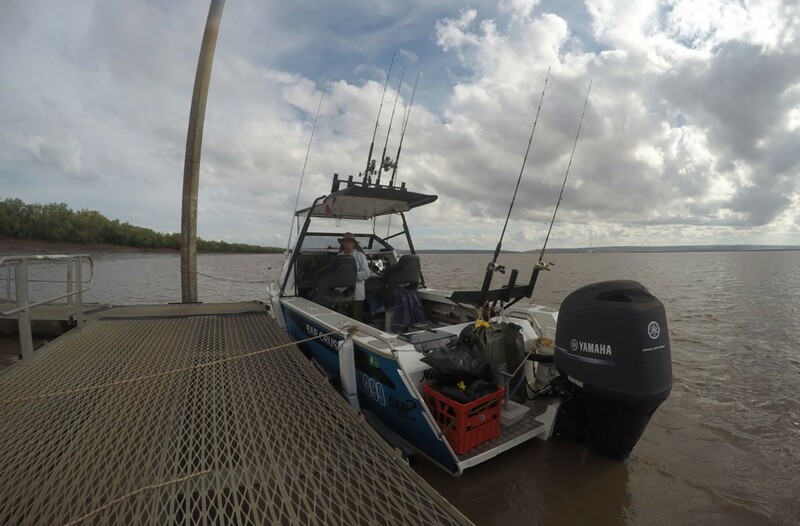 We loaded our 150hp Yamaha-powered 615C with 620L of fuel (200L in the long-range underfloor tank, two 60L drums, seven 20L plastic jerry cans, and eight collapsible 20L jerry cans), an inflatable rubber ducky, a 45L fridge/freezer, a 20L fridge, a 80W slimline solar panel, two 10L water containers, food, drinks and, of course, a sense of adventure. 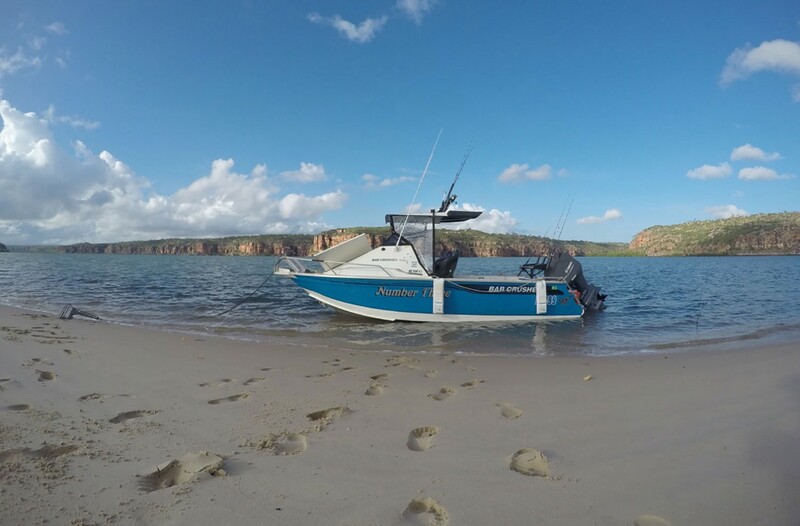 We towed our boat from Karratha to Wyndham – a distance of approximately 1800km – where we launched. Using the boat ramp at Wyndham requires great care, due to the big tides and the drop-offs at the end of the concrete ramp. The drive-on drive-off trailer and Bar Crusher’s marvellous Bar Catch system took all of the stress out of launching here. All we had to worry about was the croc at the boat ramp. Once on the water, the boat travelled well under the load. 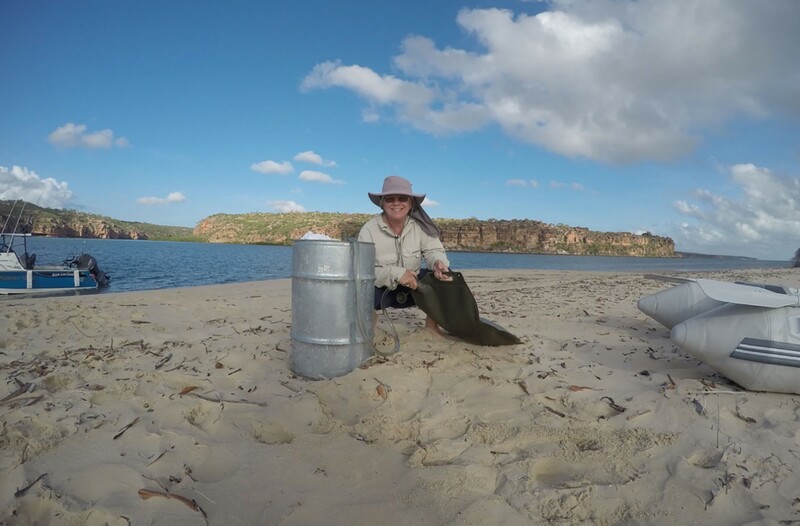 We travelled 80km up the Cambridge Gulf, then followed the coast to Thorburn Bluff to catch bait and do a spot of barra fishing. With fish onboard we headed to Berkeley River for the first night and unloaded some fuel onto the beach on Reveley Island. Anchoring near the Amphitheatre on a sandy bottom we relaxed and enjoyed the view of the stars. Heading out early on the morning of day two we stopped at Gallery Bay. The entrance to the bay is shallow with submerged boulders, so we used the Bar Flap to keep the ballast tank empty and had no problems. Having read about aboriginal Bradshaw rock paintings in the area, we were keen to see them – and we weren’t disappointed. Arriving at King George River later that morning, we unloaded some more fuel drums at the river mouth then went exploring up its length. 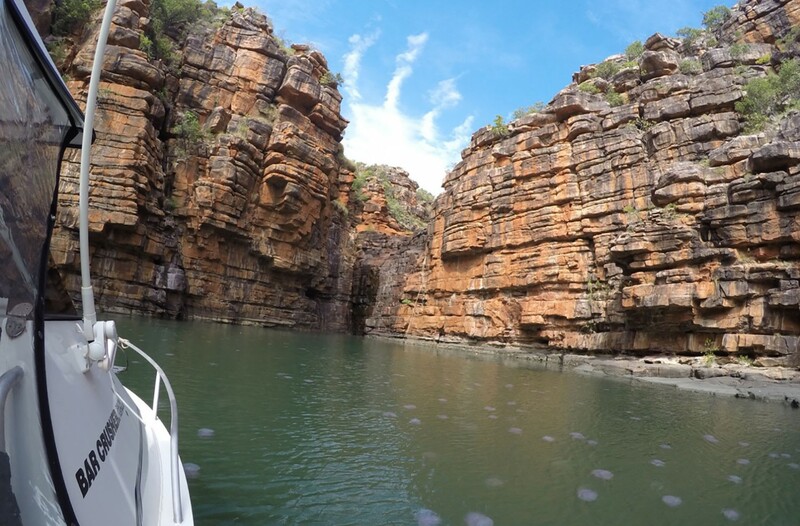 Huge red rock gorges that glisten in the sun and magic little creeks that are home to mangrove jacks and barramundi. An absolutely awesome place! Twin Falls are the main attraction at King George River, located around 12km from the river mouth. Whether they are in full flow or not, they are still very impressive. At the base of the falls the bottom drops off to a depth of 55m. 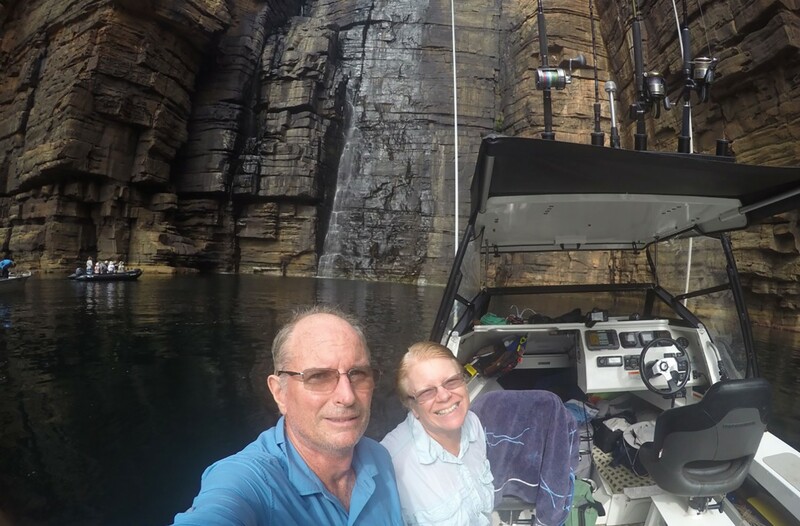 The East Arm Falls has a rope ladder to climb to the top, but we weren’t prepared to take the chance of falling into croc-infested water. We anchored off the sand bar at the mouth for the first two nights, until our friends departed early and we looked for something away from the mangroves and mozzies. 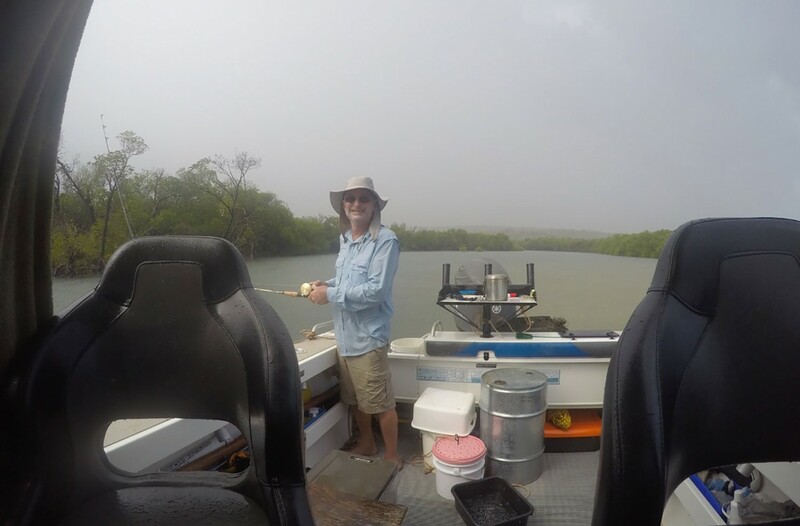 That same afternoon the heavens opened up, but Graeme was undeterred and fished in the rain – it was warm and the fish were biting. We spent the next seven days contending with the rainstorms and nestled under our tarp, which was propped up by oars in the rod holders. We had found a sheltered bay further up the river that protected us on one side, however, when a break in the weather came we took advantage and headed home. The wet season had arrived late and there was more rain coming. Departing at dawn on day 10 of our journey, we negotiated big seas all the way to Berkeley River and our fuel store at Reveley Island. A quick dash to pick-up the fuel and we were off again, ahead of another oncoming storm by minutes… until we turned into the Cambridge Gulf and it caught up. We didn’t care, as we were safe. High-fives all round… another Bar Crusher adventure done and dusted. 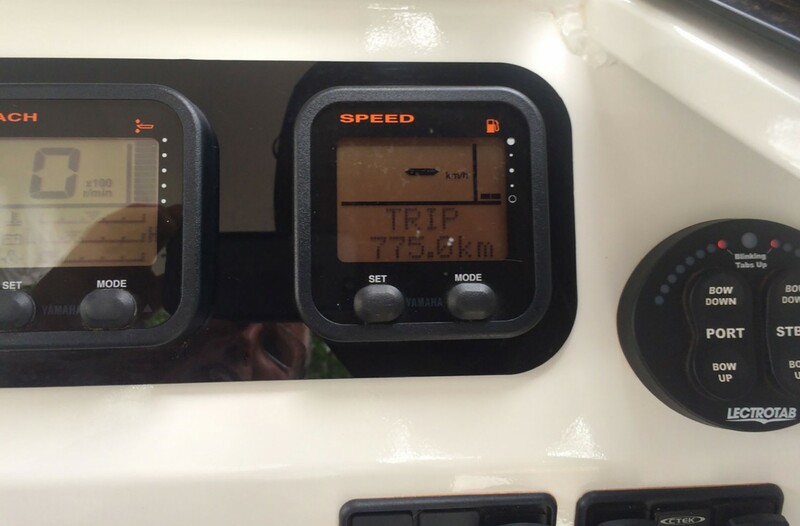 Having travelled 775km on the water, our Bar Crusher 615C proved it was certainly suited to the task and we would definitely do the trip again! – an electric winch is one of those options you should never leave home without!